Stephen King is a master of what-if books. For instance, his novel Under the Dome is based on this premise: What if a bubble-like, transparent, but completely impenetrable dome a few miles across suddenly was placed over a New England town? Nobody gets in, nobody gets out. What would happen? Then King builds an entire novel around this unlikely, impossible and ridiculous assumption. In King’s novel The Stand, he speculates that a human-made deadly virus accidentally gets out and kills 99.9999 percent of the population. Only a handful individuals survive. That’s the what-if scenario. Then a novel of well over a thousand pages follows, building an entire world based on that premise. Stephenson also likes to write what-if novels. Seveneves starts: THE MOON BLEW UP WITHOUT WARNING AND FOR NO APPARENT reason. What would happen if that actually occurred? DODO is such a what-if book. What if magic existed? Yes, magic like witches that can cast spells, like turning a man into a frog, or changing the order of playing cards in a deck, Harry Potter kind of magic. It’s a preposterous assumption, and it was enough to turn me off before I even picked up the book. But then, a friend and frequent commenter on this blog (MB) told me to get over the magic part and read DODO anyway. So I did. I did not regret it. 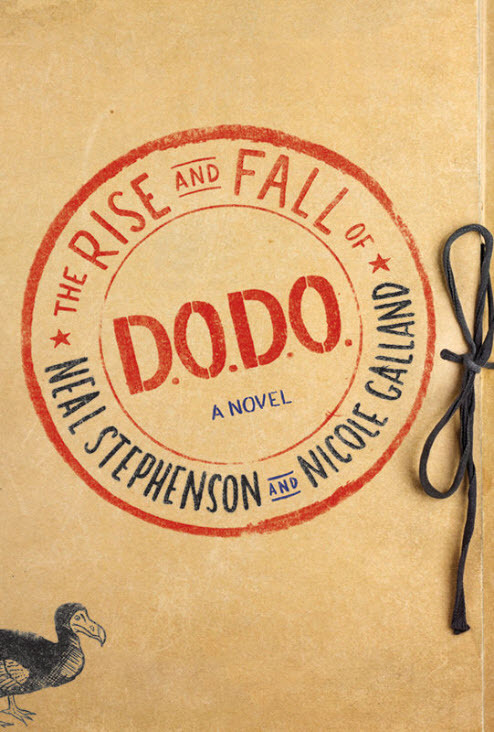 Besides being a book that speculates about magic, DODO is also a time travel book. Time travel is one of my favorite science fiction genres, and it even has its own category in the selector on this blog. If you are ever interested in finding books about time travel, I have a wealth of them reviewed right here. To expand: What if magic existed and what if witches could send people back and forward in time by casting spells? What would happen in a world of 2017, with iPhones, Google, the Internet, and black-budget arms of the United States government, like D.O.D.O, the Department of Diachronic Operations? Imagine the United States military, with its ridiculous bureaucracy, its totally confusing acronyms and endless procedures manuals getting mixed up in magic! Tristan Lyons is a major in the United States military. Melisande Stokes is a post-doctoral linguistics expert and renowned polyglot, primarily of ancient languages, like Greek, Latin, Hebrew and many others. Lyons recruits Stokes to help him translate ancient texts that reference magic. Magic seems to have been prevalent in early human history, but has abruptly stopped in the mid 19th century. As the two research, they eventually find that a single event in July of 1851 finally stopped magic worldwide. With the help of a renowned physicist and research of the concept of Schrödinger’s cat, they build a machine inside which magic is possible in the 21st century. Now they just have to find a witch, and they can travel in time. And travel they do, and problems they create. DODO is a delightful book in so many aspects. For instance, one of the main protagonist organizations is the Fugger family, one of the wealthiest medieval European banking families. This was fun for me, because I had just read The Richest Man Who Ever Lived a couple of years ago, which chronicles the life of Jakob Fugger, a Bavarian banker from Augsburg who was, in his day, the richest and one of the most powerful men in the world. He told kings what to do, because he had the money to fund the kings. The Fugger family is central in the plot of DODO. The most remarkable thing about DODO is the completely unconventional and, shall I call it experimental, structure of the book. If a lesser author had tried to pull this off, it would have been a dismal failure. But Stephenson made it work: The format and framework of the book is nothing like I have ever read before. It’s not narrated in the first person or the third person. It is a largely chronological assortment of diaries, emails, internal blog posts, government memos – sometimes heavily redacted, handwritten notes, narratives, translations, Wikipedia entries, and historic references. No one person tells the story. The author does not tell the story, and there is no major protagonist who tells the story. The various documents and excerpts, just posted one after the other, eventually tell the story. It’s a brilliant, new format that I have never seen done before, and it won’t be applied again. I would normally have given this book three stars, but the completely refreshing and innovative format, and the fact that Stephenson pulled it off successfully, made me bump this book to four stars. It’s a must-read, not because you like time travel (or magic), but because it’s something that has never been done before and therefore is unique. Is there an award for unique? Zu Under the Dome von Stephen King. Zufällig habe ich gestern einen Film gesehen, der zu dem Thema passt. Allerdings ist in dieser Geschichte einer Frau durch eine gläserne Wand vom Rest der Welt abgeschnitten und muss wie Robinson ganz alleine zurecht kommen. Schwere Kost, aber sehr beeindruckend mit wunderschönen Bildern. Im Endeffekt sind wir halt doch ganz allein auf der Welt. Kein Hollywood! Das Buch ist von Marlen Haushofer: “Die Wand”. Zum Glück sind wir aber doch nicht ganz allein! Ich habe Fanny und die Jungs, du Trisha und die Kinder, und noch viele Freunde. Leider können wir nicht zur Hochzeit kommen, wie schon gesagt. Ich hätte gern dein Gesicht gesehen, wenn plötzlich zwei german Guys auf dem dancing floor, wenn es so was gibt?, erschienen wären. Ich würde euch aber gerne ein kleines Geschenk schicken, nur habe ich eure Adresse nicht. Bitte schick sie mir doch. Viele Grüße. Adresse und antwort via email.